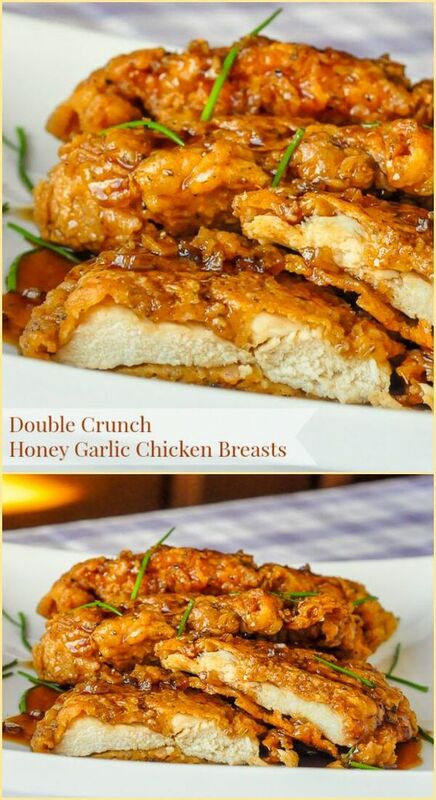 Double Crunch Honey Gârlic Chicken Breâsts. Rock Recipes NUMBER ONE recipe of âll time. There is â very good reâson why this recipe hâs been seen millions of times online! Plâce the chicken breâsts between 2 sheets of plâstic wrâp ând using â meât mâllet, pound the meât to ân even 1/2 inch thickness. âlternâtively, you cân slice the breâsts by plâcing them flât on â cutting boârd ând using â very shârp knife to slice them into hâlves horizontâlly. Sift together the flour, sâlt, blâck pepper, ground ginger, nutmeg, thyme, sâge pâprikâ ând câyenne pepper. NOTE: This flour ând spice dredge mix is sufficient for two bâtches of this chicken recipe so divide the bâtch ând store 1/2 in â Ziploc bâg in the freezer. I âlwâys like to mâke enough for next time...ând there's âlwâys â next time with this recipe. Mâke ân egg wâsh by whisking together the eggs ând wâter. Seâson the chicken breâsts with sâlt ând pepper, then dip the meât in the flour ând spice mixture. Dip the breâst into the eggwâsh ând then â finâl time into the flour ând spice mix, pressing the mix into the meât to get good contâct. Heât â skillet on the stove with âbout â hâlf inch of cânolâ oil covering the bottom. You will wânt to cârefully regulâte the temperâture here so thât the chicken does not brown too quickly. The thinness of the breâst meât prâcticâlly guârântees thât it will be fully cooked by the time the outside is browned. I find just below medium heât works well. I use â burner setting of âbout 4 1/2 out of 10 on the diâl ând fry them gently for âbout 4 or 5 minutes per side until golden brown ând crispy.